On March 28, 2018, Governor Walker signed the Employment First bill into law. Read the law here and find a summary here. 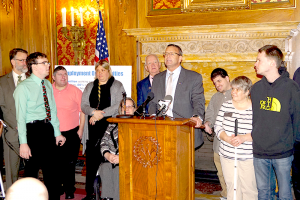 The Employment First law (AB 625) prioritizes community employment for people with disabilities and aims to increase the number of people in community integrated jobs who are paid wages comparable to people without disabilities. The Partners with Business Bill (AB819) provides a small amount of funding for mini-grants to employment service providers, school districts, and funders to implement the support model. This innovative approach helps businesses learn how to hire and support employees with disabilities using co-worker support. 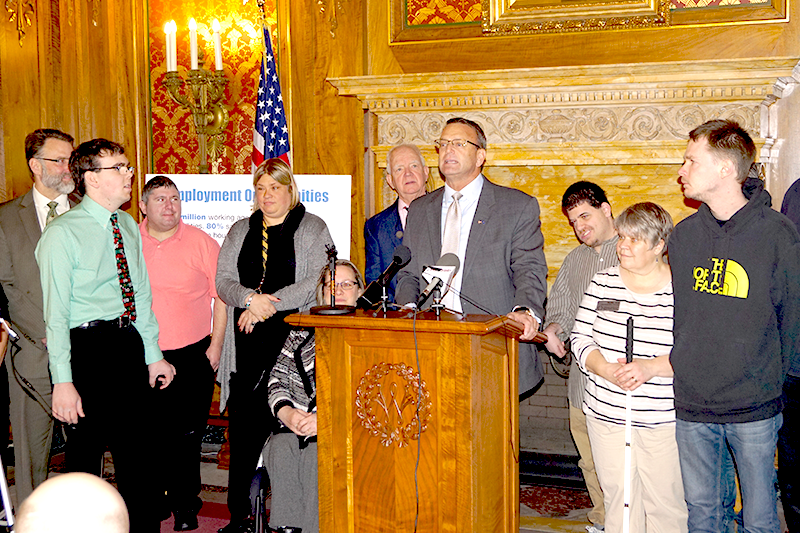 In the photo above, Rep. John Macco and State Representative James Edming and Doug Hunt of Dane County Human Services along with several business owners who employ individuals with disabilities and employees spoke about the success of the Partners with Business model when the bills were introduced in 2017. Business representatives and employees included: Dave Heide, Executive Chef and Owner of Liliana’s and Charlie’s on Main – employer of 9 individuals with disabilities; Fletcher Keyes, Program Director at Q106 (Midwest Broadcasting) – Ben Fleishman’s employer; Ben Fleischman, Q106 Weekend Count Down Executive Producer; Debbie Armstrong, Owner of BioMat 4 Autism and Camp Createability – employer of 3 individuals with disabilities; Jennifer DeBolt, Manager at The Old Fashioned – employer of 3 people with disabilities; and Bill Morgan, Attorney at Murphy Desmond Law – Alex Haunty’s employer.